Behind the center diamond that you choose to set in this ring you have two rows of pave diamonds, outlined by milgrain accents resembling a long, skinny leaf. Underneath, rose gold detailing adds not just additional flair, but color as well. French cut pave diamonds going down the band and the center diamond that you choose will make this 18k white gold band a sure winner! We like this ring because it's not too simple and not too complex. The pave diamonds add extra flair that you don't get on a solitaire ring without going overboard with extra details. Beautiful white gold pave diamond engagement ring featuring 16 smaller round diamonds set in the band and tapering in towards the center diamond to make it stand out. You can choose any shape diamond to set in the center, and total diamond weight of the pave diamonds is 1/4 carat. 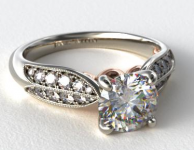 Pave engagement ring? 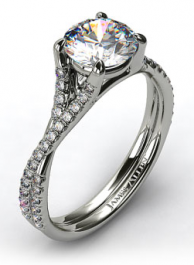 Sidestone engagement ring? Both, I suppose. This engagement ring generates compliments with its beautiful 14k gold band (a bit on the thinner side), fourteen pave diamonds totaling .5 carat, and the diamond that you choose to set in the center. This ring can be set with any shape or size diamond. When you are looking for a ring that is elegant but has some sass the Intertwined Pave Diamond Engagement Ring in 18k white gold is one to consider. Surround the center diamond of your choice with a beautiful 14k white gold band, 2 pear shaped sidestones, and 8 round diamond pave diamonds. 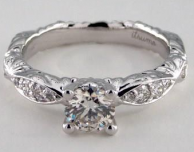 You can put a diamond of any shape in the center of this ring -- she's sure to love this one! This unique, sparkling engagement ring features a beautiful, knife-edge band with pave diamonds on either side that splits apart at the top where it holds your center diamond. 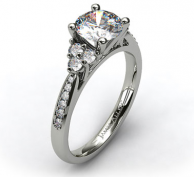 This 14k white gold setting also contains additional small diamonds embedded on the prongs securing your center stone. This ring is made for a round diamond, but it can also be set with a fancy shape diamond for an extra $150. The elegant 14k white gold band opens into a looping split shank next to your center diamond, all while micropave diamonds add additional sparkle to this setting. You can set this ring with a diamond of any shape or size. If you want to keep things simple yet add in some sense of style this Classic Halo Diamond Engagement Ring in 14k White Gold is a ring to consider. When you make your proposal, your fiancé is going to have her breath taken away. This exquisite ring is as close to perfect as you can get. Inspired by antique designs, this modern-style engagement ring features a swirling pave shank that twists around the center diamond. 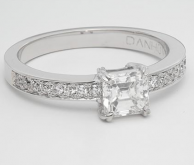 This engagement ring features a reverse taper 14k white gold band that widens as it approaches the center diamond. 1/3 carats of pave diamonds add additional sparkle to the band. 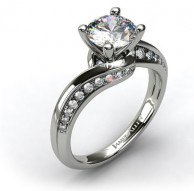 Also versatile, this setting can accommodate a diamond of any shape or size in the center. 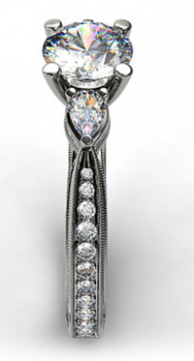 Spectacular ring with pave-studded infinity twists intertwining around either side of the center diamonds. 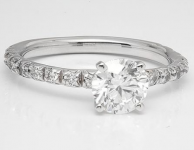 If you want to show your princess that you want her to become your queen, the Graduated Band Milgrain Engagement Ring in Platinum is the way to do just that. 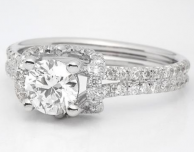 You are able to customize the center diamond to perfection and the ten round diamonds on the ring’s shank are sure to please her exquisite tastes. 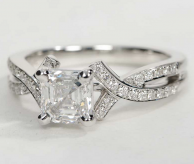 This is a great engagement ring -- Blue Nile decided that one row of micropave diamonds just wasn't enough, and that no less than three rows would suffice here. I think they're completely right, though. The pave diamonds are understated enough to not overly decorate the band, but exquisite enough to add a sophisticated sparkle to the band. This dazzling engagement ring features a beautiful 14k white gold band with a unique twisted design and pave diamonds providing extra sparkle. Pick your center diamond (must be round) to create an amazing engagement ring.